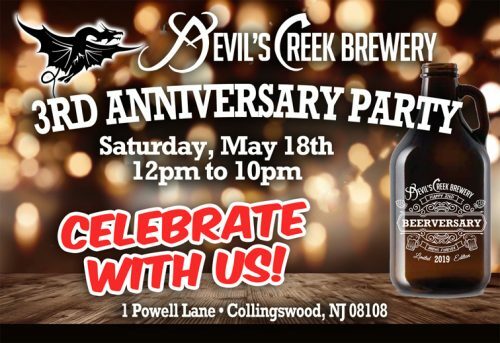 Devil’s Creek 3 Year Anniversary Celebration! OUR 3 YEAR ANNIVERSARY PARTY!!! SATURDAY, MAY 18TH, NOON TO CLOSE! We’re celebrating 3 years of beer in May!!! Come party with us and our awesome employees!!! We’ll have tons of stuff going on… more to come! But look for our delicious Birthday Cake beer, cans of Caramel Apple, bourbon-barrel aged Jolly Quad and more!!! SAVE THE DATE!